The following is an extract from the well known medical sciences textbook, Gray’s Atlas of Productivity. It describes some of the most common productivity-related conditions experienced by students during their days at university. The student will put off work until the time at which the student perceives the time available to be exactly equal to the time required to complete the work. Lastminitus sets itself apart from related conditions (see: procrastination) in that the student will not even attempt to fool themselves (or others) into thinking they are doing the work. The condition is most commonly found in first and second year students. If the student is able to correctly judge the amount of time required to complete a task, Lastminitus is relatively harmless. In severe cases the condition can cause the student to regularly hand in work which doesn’t reflect their true ability, or miss handing in work all together. In most cases the condition will resolve itself with age and experience. In some instances shock therapy is required. This will generally be self administered through the student realising too late that not enough time has been allocated for an important piece of work. The student will do anything and everything they can think of to avoid doing the work they should actually be doing. Addiction to opiates such as flash games, iPlayer, YouTube, Angry Birds and similar drugs is a normal side effect of this condition. Procrastination is an extremely common, chronic, condition which can be found in all students, but with varying severity. The condition often follows the general pattern of the student starting to do work, working well for ten minutes, feeling good about themselves, and deciding to take a short break by watching videos of kittens on YouTube. A trance is then entered into in which the student loses control over what links they click next. Typically the student will come out of the trance about five hours later having watched, and enjoyed, a subtitled documentary about the way in which forgotten symbols from ancient Greece can still be found in certain modern-day Slovenian pottery. The specific manifestation of procrastination in any given individual will vary. Procrastination can be highly contagious. Procrastination can be very damaging. Even when the student is fully aware that they have to do work and that their grades will suffer otherwise, they often find themselves completely unable to be productive. It is commonly thought that procrastination cannot be cured, and instead has to be managed. The way in which this is done is individual, and found through experience and guesswork. When managed properly procrastination can be completely harmless. The student will repeatedly spend all night doing work, often choosing not to do work during the day. Allnightomnia is a complex condition believed to have its origins in the mistaken belief that people who spend all night doing work are necessarily more productive. The student will often spend the day doing nothing, believing that they “work better at night anyway”. For some students this may be accurate, for others it is a delusion. 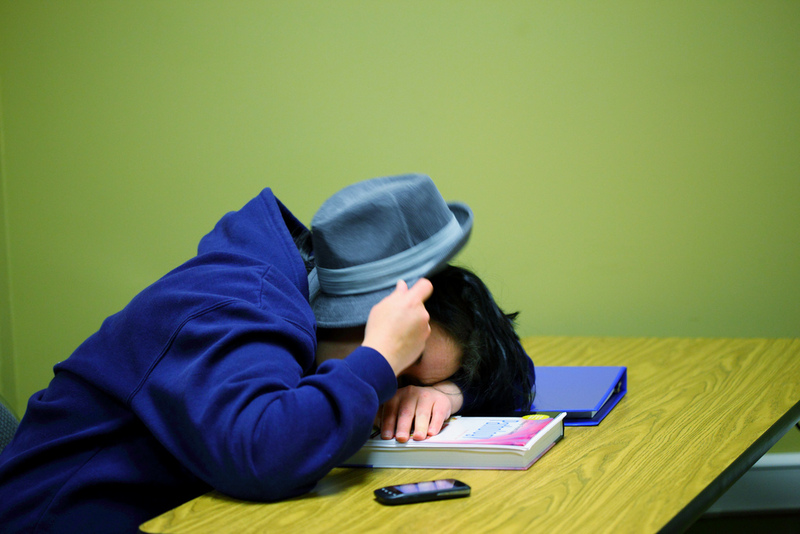 If the condition goes unchecked, the student will start suffering from sleep-deficiency. If a student has been awake all night productivity the following day is often severely decreased, especially if Allnightomnia becomes a regular occurrence. Over time Allnightomnia will almost always decrease the amount of total work the student gets through. In some cases, if working at night becomes a habit, the student might find themselves unable to “switch off” at night even when they aren’t supposed to be working. Allnightomnia is normally cured by the student realising that their overall output of work has decreased, causing them to re-evaluate their approach to productivity. The student can always be found in a lab or a library. They are on first name terms with the early-morning cleaners and know the names of the cleaner’s children. Domino’s have made an exception for them, happily delivering at least 5 “meals” a day to said library or lab, despite their general policy not to deliver to public places. This condition most often arises when the student, desperate to get work done, decides that the more time they spend in the library, the more time they will spend doing work. Productivity-related risks are limited, though personal risks are significant. If left untreated the student will start neglecting social commitments, eventually finding themselves without social commitments all together. In some cases the student suffering from Labrattery can become a biohazard. Labrattery is a hard condition to cure, as its occurrence is often correlated with an actual increase in productivity. This can cause the student to see the negative effects of Labrattery as an acceptable trade-off. The student has to be convinced that there are other, more sensible, ways of achieving the same output. The symptoms caused by this condition vary significantly from student to student. In most cases the level of stress experienced by the student will rise significantly, but the way students tackle this additional stress will differ. Some will take to speaking loudly and shouting at people, while others may sit quietly and despairingly with their face planted in a desk, pulling their hair out in large chunks. This condition is caused by the student being put in a situation where they are required to interact with other students in an academic manner. The severity of the condition, as well as the potential for serious bodily harm (to both the affected student and, indeed, those in his or her group) will depend on the overall makeup of the group. The way in which a specific student can affect another student depends on a number of random factors, but can be intensified by a perceived difference in academic ability. While Groupworkious will be relatively harmless to most students, for some it can have lasting implications. A common long term effect is a grade which doesn’t reflect the ability and/or the amount of work that was put into an assignment by an individual student. Occasionally the condition can have a more serious consequences as a result of the student pouring much more time into the project than what is necessary or useful. This may be done to make up for the lack of work done by others, or out of guilt, trying to make up for work that should have been done previously. This can in many cases have a strong adverse effect the grades obtained by the student in other subjects. Come on! I’ve written all the other sections of this condition, surely you can handle the cure?! Are you expecting me to do ALL the work? What’s WRONG with you?!?!?! Image by D Sharon Pruitt, used under the CC licence.